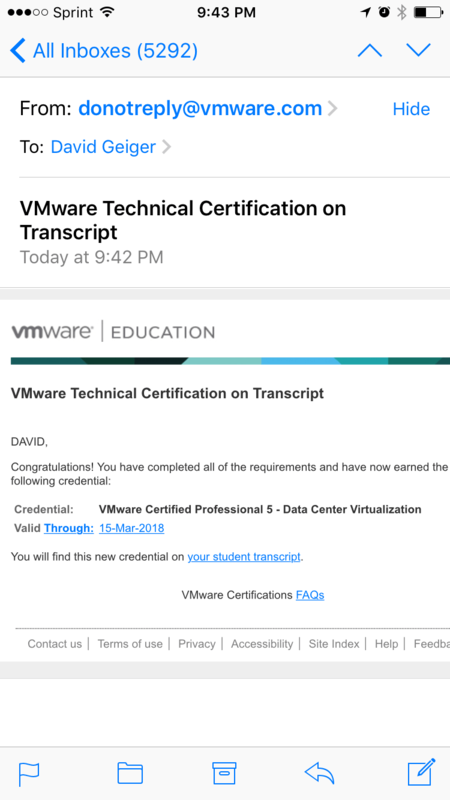 Passing the VCP5-DCV was far more challenging that I thought it would be, but I did it. I want to give you every edge I can, so here are my last bits of advice to help you get this certification. 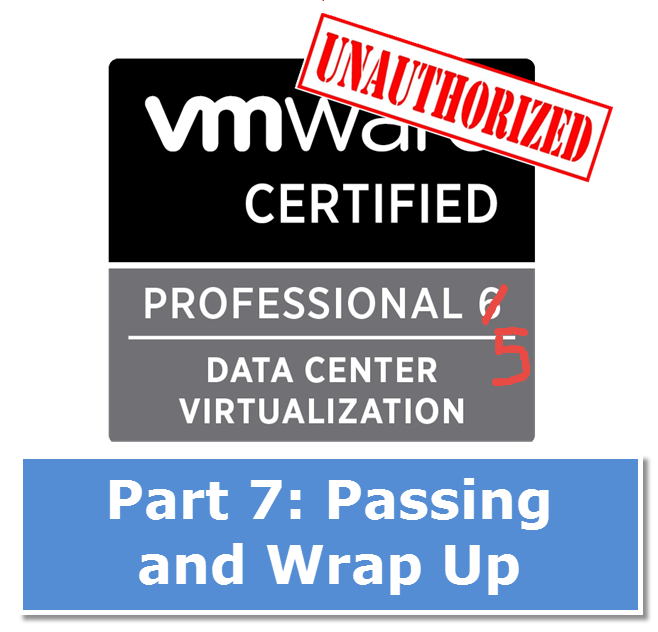 This is the wrap-up post on this series, Becoming VCP: The Unauthorized VCP Cert Guide- which is all about passing this challenging exam. You get get up to speed with everything that’s happened along the way by visiting the first post, or go to the bottom of the page for a listing of all of them. Thanks for being here! In the end, I ended up with a score of 349/500. Not as good as I like to get, but I’m happy to take the win. Here are my last bits of wisdom before you go down and sit for- and hopefully passing- your VCP exam. I’ll be honest- after the first 5 questions, I was sweating passing this test. I had studied for what seemed like an eternity, and I was barraged with questions that were certainly included in the domains I’d reviewed, but they seemed just outside my grasp. Using a home lab is a given, but if you want maximum exposure to what will be on the exam, you should do more than just the basic configuration. Generally, the courses are around installing, configuring, and managing vSphere- but they don’t get into the other products. Set up vSphere Data Protection. Break your hosts. See if you can set up Linked Mode. Use the command line. Look at logs. I realize that these things are a bit more advanced, but this test is not just on ESXi and vCenter. If you don’t work with vSphere full time, you have to create scenarios that will show you how the insides work. You do not want to try to pass this exam on an empty stomach. I always schedule my exams for around 9 or 10 in the morning. This allows me to have a nice breakfast (not too much) so I’m not feeling hungry during the test. This was was for after the test. You probably don’t want to eat one of these right before you take the exam. There are few things worse than trying to recall complex subjects- or deduce exam questions- while you’re stomach is talking back to you. 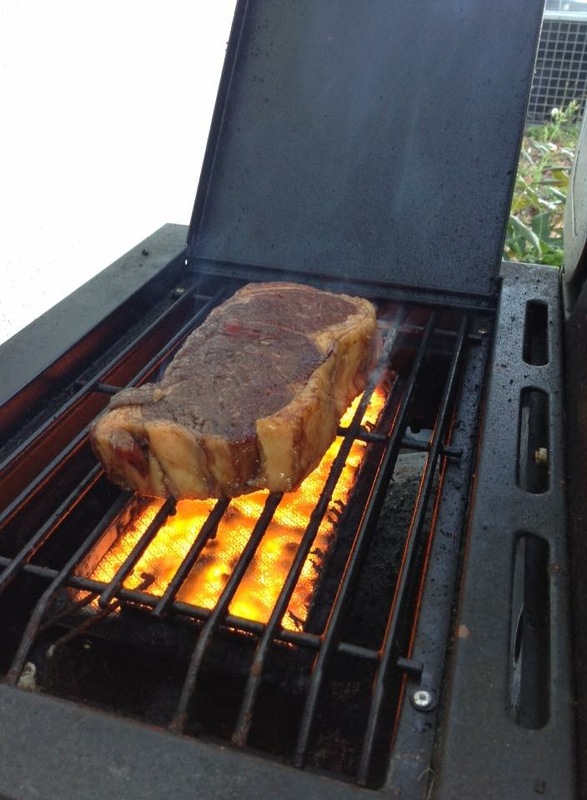 Some people get hangry– sort of hunger-induced irritability. Not a good test-taking state. Easy on the Venti-Doppio-Extra-Foam-No-Whip-Nonfat Soy Vanilla Lattes also. You don’t want to have to “answer the call” while in the middle of the test. Some people give themselves an afternoon option, like around 2pm, so they can be full and feeling good from lunch. This is an OK strategy, but I’m my best in the morning. But it’s a way to go if you’re super-busy. My employer wanted me to get this certification, so I took it during my workday. If you don’t have that luxury, think about taking the a half or whole day off. Doing it this way will allow you to focus on one thing- passing this test. The last thing you want is to be distracted by work you have to do later, or a meeting you just had before you sit for the exam. Most people will probably not be able to score 500 out of 500- it’s just too deep and broad of a product- so don’t make that your goal. As I started to get into the exam, I realized just how broad of a product vSphere really is: I absolutely did not know the answers to the first 5 questions. Did you ever take a test in school that you were just plain unprepared for? I have, and the feeling is sickening. I got that feeling when I first started the test. I had to grab a hold of myself, however, because I was prepared for it. I knew I’d put in countless hours working with and studying materials. Just knowing that you can’t know all of the questions should help most people. Don’t worry- if you’ve practiced the domains and know your way around vCenter, you should be fine. I received this advice from a new (to me) VMware engineer that recently joined my team. Your gut is probably right most of the time. You can certainly mark questions for review before you submit the test for a final score- but I did not. Once I selected my answer, sufficiently debated it in my head, I just hit “Next” and moved on. Second-guessing yourself won’t help. Just trust yourself and your preparation. I sent out an email to my subscribers the night before the test, and I told them to watch Twitter to see if I passed. While I was elated that I did pass, I also realize that it’s a tough test, and not everyone will pass it on their first shot. I was also prepared to accept failure and announce that as well. If you do happen to fail this test, don’t take it too personally. Failure is an event, not a person. You just need to go back to the basics and study up again. Be honest with yourself- did you do all the best practices? If you left some of these out, make sure to commit again to do them, and schedule your next exam date. If you used Stanly, you should have 3 discounted attempts at the test. You will get confirmation that you passed or failed on the spot. Make sure that you call your Number One and let them know how you did- good or bad. If you failed, you have my permission to celebrate that learning experience over the beverage of your choice. You can also reach out to me if you need encouragement. I’m here for you. If you passed, make sure you follow through and celebrate! I plan on getting a new watch, as is my custom when I pass a certification test. I initially thought it would be another G-Shock, but now I may have to think about the Apple Watch. Decisions. Because I’m a complete dork, I logged into mylearn.vmware.com and checked my transcripts within about an hour after passing. Nothing yet. I printed out my certificate (because dork) and put it next to my VCA6-DCV certificate at work. Make sure you also take some time to update your LinkedIn and other profiles with the cert. I’m making some decisions now as to what certification to go after next. It’s between going further down the VMware track to VCAP6 or getting something with Amazon Web Services. While I may not go as in-depth on those, I will be sure to write about those experiences and pass on whatever tips I can. I realize that I started out trying to get to VCP6-DCV, but after realizing that there are minimal differences between the two, I think by efforts (and $225) are better used on VCAP6 or AWS. 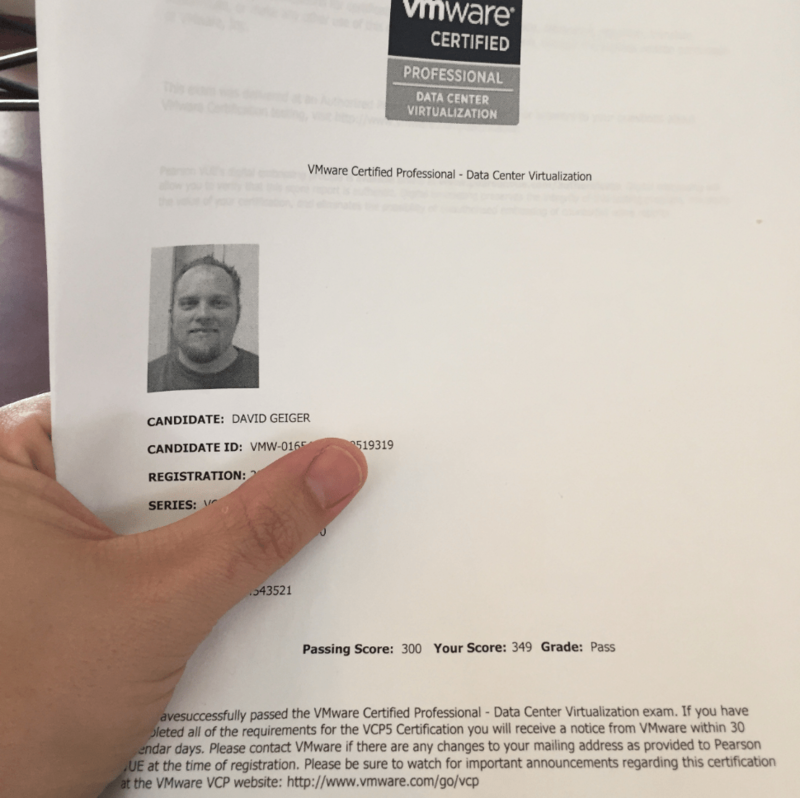 Passing the VCP5-DCV certification- and blogging about it- was a lot of fun and I sincerely hope you found value in this information. Thank you for coming on this journey with me! Let me know if I can help you. My friend enrolled in the Jan-Mar Course from Stanly and took the exam few days ago and passed. And I started the Mar-May Session. I’ll take the exam in June. That’s awesome! Make sure you stay focused- grab an accountability partner to make sure you study, and I would consider at least installing all of the products if you can for the widest exposure. That was one tough test. Sure, I made a home lab to try all the products since my friend told me that products not covered in CBT Nuggets Series or the Stanly course are also important for the exam(Site recovery, Data Protection), so trying them is a good idea. I hear you. I wish I’d done the extras. Go get ’em! Let me know how I can help! I’d like to thank you for your series. It helped me a lot to come with a plain and study seriously for the exam like I never did before. Thanks again. I wish you good luck . Haider- congratulations!!! Very well done. I am so glad to hear that you out in the work and made it happen. I recently registered and paid for the ICM course VCP 6 at Stanly College. what is the first exam to take at vmware after completing this course ? what are the exam codes for the two tests. the reason I was confused was to know if we get vouchers for both exams after completing the stanly course ? Am starting tommorow officially with Stanly. just received an email. are those textbooks really required by gilmore global ? the ebook is not pdf downloable. ding it!!! Hey, Dan. You will get the voucher you need to do the whole VCP test. I actually got 68% off *3 attempts*! I expect you’ll get something similar. Ask the instructor if you *reaaaaally* need the book when you start. All the exercises are virtual labs and you should get a lab pdf or similar to do the work. Let me know what he says. Awesome. I had Brandon as well. Have fun, lab-lab-lab, and study.